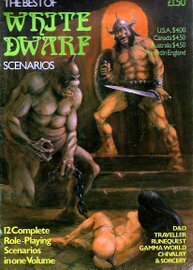 ARTICLES: The Monstermark System (A method for assessing D&D monster malignity) by Don Turnbull; The Magic Brush (Fantasy figure painting as an art); The Barbarian (A D&D Character Class); The Houri Character Class (An alluring D&D subclass); The Barbarian (An introductory fantasy boardgame) by Lewis Pulsipher; Chronicle Monsters (Thomas Covenant in D&D) by Lewis Pulsipher; Expanding Universe (Additions to Traveller rules) by Andy Slack; The Fiend Factory (The Top Ten monsters from this popular department); D&D Campaign (Philosophy and mechanics of Dungeon Mastering) by Lewis Pulsipher. 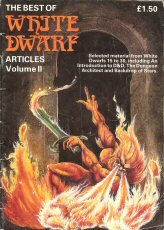 "Selected material from White Dwarfs 15 to 30, including An Introduction to D&D, The Dungeon Architect and Backdrop of Stars." 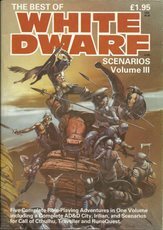 * The Best Of Fiend Factory"
12 complete role-playing scenarios in one volume: D&D, Traveller, Runequest, Gamma World, Chivalry & Sorcery. 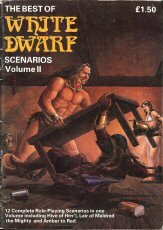 CONTENTS: Hive of the Hrrr'l - D&D Flymen scenario; Lower Canon Court - Clerical D&D Skirmish; Sorry! 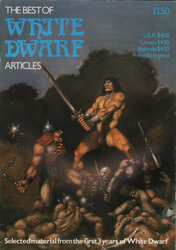 - Short Traveller adventure; The Black Manse; Operation Counterstrike - Interplanetary D&D Scenario; Weed War - Submersible Traveller scenario; One-Eye Canyon; Amber to Red - Traveller; Search for the Golden Spire - D&D; Shadows in the Swamp; Lair of Maldred the Mighty - Epic D&D scenario; The Desert Light. 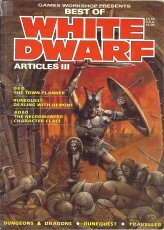 ARTICLES: Watchers of Walberswick (Call of Cthulhu); Eagle Hunt (AD&D); Irilian, a complete AD&D city (Parts 1-6, 30+ pages); Rumble at the Tin Inn (Runequest); Snowbird Mystery (Traveller).